Two basic watercolor painting techniques. Left: Wet-on-dry. Right: Wet-on-wet. © Marion Boddy-Evans. Licensed to About.com, Inc. The painting terms wet-on-dry and wet-on-wet do simply mean "wet paint applied onto dry paint" and "wet paint applied onto wet paint." 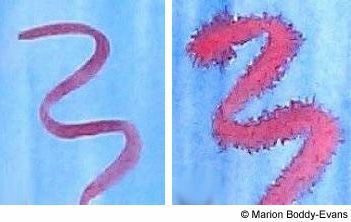 It's important to know you have these two options, or techniques, as laying color on wet or dry paint produces very different effects. Painting wet-on-dry produces sharp edges to shapes, whereas when painting wet-on-wet, the colors will spread into one another, producing soft edges and blending. Knowledge of this can also help prevent you from being frustrated by the paint not doing what you expect. If you want sharp edges to what you're painting, then any paint already put down on the paper must be dry before you paint another shape. If it is completely dry, then the shape will stay exactly as you paint it. If it isn't completely dry, the new layer will diffuse into the first (this is done deliberately when you're painting wet-on-wet). Adding paint to a wet layer of paint on the paper produces a soft, diffused look as the colors mix. The extent to which the two colors mix depends on how wet the first layer still was and how dilute the second color was. You can get anything from a soft-edged shape to a widely spread pattern. In the right-hand example here, the blue was just slightly damp when the red stripe was added, so the red hasn't mixed very far into the blue. Being able to predict the results you're going to get when working wet-on-wet takes practice, but as this technique can produce spectacular, lively paintings, it's well worth experimenting with it. It's particularly useful for suggesting movement in a painting and for diffusing shapes when you don't want too much detail. If you paint a shape with clean water and then paint a color on it, it'll run up to the edges of the shape. If you touch a brush loaded with color in the center of this shape, the color will flow into the moistened area, bleeding toward the edges. Don't stop with only two colors. Use your color mixing knowledge to create, for example, a sunset of deep purples, reds, and oranges by painting red, blue, and yellow wet-on-wet and letting the colors mix on the paper instead of premixing them on a palette. Get the colors ready before you start painting, plan where you're going to put them, and then work fast so you get everything down before your painting has dried. How Do You Paint Clouds Using Acrylic or Oil Paints? 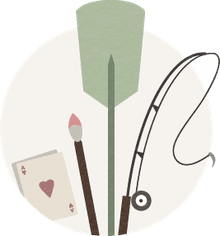 What Supplies Do You Need to Start Watercolor Painting?